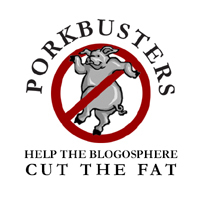 I’ve been very interested by the blogging exercise that has evolved into Porkbusters this past week. The basic idea: offset the billions of dollars being spent on Katrina relief with cuts in pork spending. The meme has picked up speed since it was formalized on Sunday, and has received some media attention. I personally like the concept a lot, but so far Congress doesn’t appear to have the same appreciation. Will they actually have the guts to sacrifice money earmarked for their states and districts for the greater good? So far, it doesn’t look good. In fact, only democrat Nancy Pelosi has committed to returning federal money ($70 million) to help pay for Katrina. I’m actually really impressed with her – I wish I could say the same for everyone else, especially republicans who claim to want smaller governments. So, looking at the Pork by State feature of the Porkbusters site, I noticed that North Dakota still doesn’t have any pork listed. Our senators are famous for bringing home the bacon, so I was a litlte surprised by this. After doing a little bit of research as a responsible citizen, this is what I found. Using the 2005 Pig Book search offered by the CAGW, here are some of the largest pork spending projects that Byran Dorgan, Kent Conrad, and Earl Pomeroy have brought home to North Dakota. It’s important to note that while these may be in the best interest of North Dakotans, they are defined as pork projects because they were obtained by circumventing established budgetary procedures. For more details, please see the Pig Book FAQ page. If my math is correct, that’s $44,748,000 right there, not even including any of the projects that were less than a million dollars (and there are a lot of them). My next step is to actually give my senators and representative a call to see if they’ll commit to returning any of the money. I already know the answer, but it’ll be nice to hear it myself!